Listening to Tommy and now Ben Rhodes really helps break down world events and put a great perspective on complicated events. First, Tommy and Ben Rhodes talk about the NSA shutting down its controversial metadata program, more accusations of antisemitism against Ilhan Omar, Trump's stonewalling of Congress about the murder of Jamal Khashoggi and his flipflop (again) on keeping troops in Afghanistan and Syria. Then, former Deputy Secretary of State Bill Burns joins to discuss his new book The Back Channel. Tommy and Ben explain why Trump's second North Korea summit was a total disaster. Then they discuss escalating tensions between India and Pakistan, Justin Trudeau's troubles in Canada, a can't-miss rant about Jared Kushner and Netanyahu's indictment. First, Tommy and Ben Rhodes talk about India bombing Pakistan, Trump's second meeting with North Korea's Kim Jong Un, the ongoing turmoil in Venezuela and Netanyahu's latest hard-right turn. Then, Jessica Stern from Outright International joins to discuss her work advocating for human rights for LGBTIQ people globally. First, Ben Rhodes calls in from Europe to talk about the Munich Security Summit, Steve Bannon running around Europe, and Trump selling nuclear power plants to Saudi Arabia. Then, former National Security Advisor Tom Donilon joins Tommy for a ranging discussion of how he got the job, best and worst days, relations with China, Russia, Trump's second North Korea summit and more. First, Tommy talks with author Peter Beinart about the controversy around Congresswoman Ilhan Omar's tweets, which many viewed as anti-semitic. Then, former Under Secretary of State for Political Affairs Wendy Sherman joins to talk with Tommy and Ben about the time she spent negotiating with Iran and North Korea. Tommy and Ben talk with the Washington Post's Jason Rezaian about his book Prisoner, which details the 544 days he spent in an Iran's notoriously brutal Evin Prison. Jason was held hostage by the Iranian regime and held as leverage in the nuclear negotiations. Jason details his experience while Ben explains what the negotiations were like from his perch in the White House. It is a hell of a good episode. Tommy talks with Anthony Faiola, the Washington Post bureau chief for South America and the Caribbean, about the dire situation in Venezuela. Then Ben Rhodes joins to discuss the Trump administration's approach to Venezuela's leadership struggle, the Worldwide Threat Assessment hearings in Congress, a potential peace deal in Afghanistan, Ebola, Jared's security clearance (again) and bumbling spies. First, Tommy and Ben talk with David Lammy, a member of parliament from the UK, about the slow-rolling disaster that is Brexit. Then they discuss Trump's announcement of a second meeting with Kim Jong Un, recent Israeli strikes on Iranian targets in Syria, and the latest from Afghanistan. First, Tommy and Ben discuss two stories about the Trump administration agitating to attack Iran. Then they discuss several unnerving reports about Trump potentially being compromised by Russia, followed by Brexit, the World Bank, and our Twitter troll ambassador to Germany. Then a Sudanese-American activist named Wafa May Elamin joins to discuss the ongoing protests in Sudan. First, Tommy talks with Congresswoman Elissa Slotkin about Trump's Syria flip flops and how he's demoralizing the intel community. Then, Ben Rhodes joins to talk about Secretary Pompeo's middle east trip and Cairo speech, the new authoritarian President in Brazil, and the anti-BDS bill going through Congress. Tommy and Ben Rhodes talk about Trump pulling US troops out of Syria, the MLB and Cuba, and then talk about how US policy towards Israel, North Korea and Russia could change in 2019. Tommy and Ben Rhodes discuss General Flynn's trial and what the hell he was doing for the Turkish government. Then they discuss new Senate reports about Russia's propaganda efforts, China's muslim internment camps, and updates from Syria and Afghanistan. Then French journalist and activist Rokhaya Diallo joins to discuss the Yellow Vest protests in France. Tommy and Ben Rhodes talk with former U.S. Ambassador to Israel Dan Shapiro about his time in Israel, why the Middle East Peace process failed, Trump's approach to Israel, the BDS movement, whether support for Israel is getting politicized, Netanyahu's legal jeopardy, and Jared Kushner managing our relationship with Saudi Arabia. First, Tommy and Ben talk through George H.W. Bush's foreign policy record, the good the bad and the ugly. Then they discuss the news out of the G20, the latest on Saudi Arabia, and the Democrats' foreign policy messaging. Then Tommy is joined by Kelly Magsamen to discuss Elizabeth Warren's foreign policy speech and what issues 2020 democrats should be talking about. First, Tommy talks with former US Ambassador to Russia Mike McFaul about fighting between Russia and Ukraine. Then Ben Rhodes dials in to discuss the latest with Brexit, a reported meeting between Wikileaks’ Julian Assange and Trump stooge Paul Manafort, protests in France and the climate report, Saudi Arabia, and how the US caused instability in some Latin American countries. First, Tommy talks with Karen Attiah, the Washington Post Global Opinions Editor who used to edit Jamal Khashoggi’s work, about Trump’s statement Tuesday about Jamal's murder that essentially absolves Saudi Arabia. Then he talks with Jared Holt from Right Wing Watch about his work monitoring right-wing extremist groups. First, Tommy talks with Ben Rhodes about some major foreign policy news out of Israel, Trump's visit to France and the Russia investigation. Then Tommy talks with North Korea expert Lisa Collins about a new report detailing North Korea's ongoing development of its missile program. Tommy talks with foreign policy expert Jake Sullivan about what Democratic control of the House means for US foreign policy, including US relations with Saudi Arabia, the Iran deal, Trump's ties with Russia, trade and North Korea. Tommy talks with The Intercept's Mehdi Hasan about the international community's response to murder of journalist Jamal Khashoggi and the catastrophic Saudi-led civil war in Yemen. First, Tommy ticks through some major news about UN Ambassador Nikki Haley, Saudi Arabia and Brazil. Then he interviews three candidates (Jesse Colvin, Abigail Spanberger, Lauren Baer) who have different national security backgrounds that all made them decide to run for Congress this cycle. They are inspiring and brilliant. You won't want to miss it. Tommy talks with the Washington Post's David Ignatius about Trump's visit to the UN general assembly, including potentially explosive claims by Israeli Prime Minister Netanyahu about Iran's nuclear program, Trump's love affair with North Korea and some legitimately hopeful signs, and escalating tensions with China. Tommy talks with The Atlantic's Natasha Bertrand about how the potential departure of Deputy AG Rod Rosenstein would impact the Mueller investigation and operations at DOJ. Then they discuss what we've learned about Russia's efforts to influence our elections over the past two years, and the shady right-wing characters that link Trump to Wikileaks. Tommy (with an assist from Jon Favreau) talks with former Secretary of State John Kerry about Iran, Israel, Trump's attacks and what he learned from the 2004 presidential campaign about how to respond to fake news. Tommy talks with new LA resident Ben Rhodes about the bizarre Trump NSC memo naming him leader of the Echo Chamber, the state of al Qaeda and the war in Afghanistan, talk of war in Venezuela and weird old John Bolton. Two part show this week! First, Tommy talks with the Wall Street Journal's Julie Bykowicz about new and insidious ways foreign countries are lobbying the Trump administration. Then, Tommy is joined by Vox's Alex Ward to discuss North Korea, revelations in Bob Woodward's book, new theories about what harmed diplomats in Cuba, and Burma. Last week, President Trump tweeted about a segment on Tucker Carlson's Fox News show that claimed white farmers in South Africa are being murdered and that the government is taking away their land. The Economist's Africa bureau chief John McDermott joins to explain what the hell he's talking about and what he got wrong. Tommy talks with former acting CIA director Michael Morell about President Trump's decision to revoke his opponents' security clearances. They discuss why the politicization of intelligence is so dangerous and why many former spy chiefs decided to speak out on Brennan's behalf. Tommy talks with defense expert Katherine Charlet from the Carnegie Endowment for International Peace about President Trump's plan to create a Space Force!!! How much is the military currently operating in space? Is this proposal smart, necessary or a gigantic waste of taxpayer money. Listen to this episode (which includes lasers) to find out! Tommy talks with VICE on HBO correspondent Isobel Yeung about her recent reporting trips to Raqqa, Syria and Yemen. Isobel talks about what it was like to interview two of ISIS's most brutal foreign fighters and to witness heroic efforts by average citizens to rebuild the city and find loved ones taken by ISIS. Tommy talks with Egyptian comedian Bassem Youssef about his improbable path to comedy, fame, and becoming an enemy of the Egyptian state. Two part show today! First, Tommy talks with Ambassador Michael McFaul about Vladimir Putin's request to interrogate him and Trump's shocking refusal to immediately rule it out. Then Tommy talks with the Washington Post's Jason Rezaian about Trump's late-night rage tweet at Iran and the future of US/Iranian relations. Tommy talks with Julianne Smith, a former Pentagon official and advisor to Vice President Joe Biden, about Donald Trump’s truly awful trip to Europe, and why his terrifying press conference with Vladimir Putin in Helsinki is only a piece of the lasting damage it might cause to some of America’s most critical relationships. Today's episode is two parts. First, Tommy talks with Politico's Nahal Toosi about North Korea, NATO and Trump's Putin meeting. Then, Roger Bennett from Men in Blazers joins to talk about the agony, ecstasy and politics of the World Cup. Tommy talks with Abdi Nor Iftin, the author of “Call Me American,” about his incredible story of survival in war-ravaged Somalia and literally winning the lottery to make it to America. Tommy talks with New York Times reporter David Sanger about the new world of cyber warfare. From North Korea's attack on Sony to targeting of Iran's nuclear program and Russia's invasion of Ukraine, cyber attacks are increasingly used first in war even though there's no rules of engagement and little public debate. Tommy talks with the outgoing National Counterterrorism Center chief Nick Rasmussen. Nick worked in senior counterterrorism roles for Presidents Bush, Obama and Trump, and they discussed how weird the transition from Obama to Trump was, how you hunt terrorists, how you fight ISIS propaganda, Trump's North Korea summit and more. Tommy talks with defense and Asia policy expert Kelly Magsamen about Trump's just-completed summit with North Korea's Kim Jong-un. What did they accomplish? Are we safer? Should we worry about the optics of meeting with a dictator? Tommy talks with Ben Rhodes, author of the new book "The World as It Is", which documents Ben's eight years working in the White House. They talk about Ben's criticisms of Obama, leading talks with Cuba and going to dinner with Raul Castro, becoming a target of right-wing attacks and more. Tommy talks with journalist Mehdi Hasan about a troubling series of hires on Trump's National Security Council staff of individuals with far-right, paranoid, Islamaphobic views. Then they talk about the situation in Gaza now that the protests have ended and TV cameras have left. Tommy talks with NewYorker.com executive editor David Rohde about the way Trump is handling - and showcasing - hostage negotiations as President. Rohde was held hostage by the Taliban for over seven months until he escaped in 2009. Tommy talks with Washington Post reporter Anne Gearan about the on again, off again North Korea summit, the situation in Gaza and the Trump administration's response, and Rex Tillerson's harsh criticism of President Trump. Trump just tore up the Iran deal. Tommy talks with Ben Rhodes about what happens next. Then Tommy talks with Russia expert Mike McFaul about his new book, From Cold War to Hot Peace, about his time working at the White House and as US Ambassador to Russia. Tommy talks with Pulitzer Prize winning author Ronan Farrow about his new book War on Peace and the militarization of American foreign policy. Tommy talks with ACLU political director Faiz Shakir about the nomination of Gina Haspel to lead the CIA despite her role in the Bush-era torture of terrorism suspects. They also discuss the politics of national security in the Trump era, and whether Obama did enough to hold the CIA accountable for its actions. Tommy talks with foreign policy expert Kelly Magsamen about Trump’s strikes on Syria’s chemical weapons site, his lack of a broader strategy, and her attempt to “red team” the policy options during the Obama administration. Then they talk about CIA Director Mike Pompeo’s trip to North Korea. Tommy talks with former Secretary of State Madeleine Albright about the rise of fascism around the world and her concerns about how it is being enabled (and emulated) by Donald Trump. Then they talk about how Trump should respond in Syria, and Albright’s visit to North Korea in 2000 for meetings with Kim Jong-Il. Mr. Putin goes to Washington? Tommy talks with New Yorker writer Robin Wright about Putin’s possible visit to Washington, his relationship with Trump, and what we know about Trump the negotiator vs what’s required for success. Then they discuss Robin's visit to North Korea, the situation in Gaza, Syria and John Bolton. Tommy talks with Wired editor in chief Nick Thompson about the insane amount of data that Facebook and other tech companies collect on us and what we can do to erase or prevent it. Then they talk about how to use encryption to protect your communications and scary new developments that allow you to make fake videos of real people. Tommy talks with Washington Post columnist David Ignatius about Saudi Crown Prince Mohammed bin Salman’s visit to the United States and his "reform agenda". Then they discuss Trump’s call with Putin, reports that he ignored his staff’s plea to be tougher, and the risk of North Korea negotiations. Tommy giddily discusses Rex Tillerson’s firing by tweet with Politico foreign affairs correspondent Nahal Toosi. Then they discuss suspected assassination of Putin enemies in London and Nahal’s exclusive report about Trump administration attacks on career State Department staffers. Tommy talks with Asia expert Danny Russel about reports that North Korea is willing to begin negotiations with the US about abandoning its nuclear weapons. Tommy talks with Jake Sullivan and Ben Rhodes about their new organization to oppose Trump’s foreign policy and promote a progressive vision of American leadership. Then they discuss what it means for Jared Kushner to have his security clearance downgraded, the status of the Iran deal, and the NSA Director’s plea for a directive to combat Russian hacking. Tommy talks with Nathan Guttman, the Washington bureau chief of The Forward, about the corruption scandals swirling around Israeli Prime Minister Bibi Netanyahu. They walk through the facts, what happens next, and what it means for US/Israeli relations and the Middle East peace process. Tommy talks with war photographer Jonathan Alpeyrie about being held hostage by rebel fighters for nearly three months in Syria. Tommy talks with New York Times editor and writer Max Fisher about disconcerting signs that the Trump administration is seriously considering a military attack on North Korea. Then they talk about how ambiguous demands about US credibility can lead us to make terrible foreign policy decisions, and the changing expectations in Afghanistan. Tommy talks with New Yorker staff writer Evan Osnos about China’s frantic post-election efforts to build a relationship with Jared Kushner, and why the “Kushner channel" makes American counterintelligence officials so nervous. They also discuss the shockingly-wide distribution of sensitive intelligence in the Trump White House, and how Evan feels about the threat from North Korea roughly six months after his visit to Pyongyang. Pod Save the World Live! Tommy talks with former FBI Special Agent Ali Soufan about his work interrogating terrorists and investigating the bombing of the USS Cole and the 9/11 attacks. They discuss the changing threat from al Qaeda and ISIS and what we need to know about these terrorist groups to stop them. Tommy talks with former top Obama foreign policy advisor Ben Rhodes about the protests sweeping across Iran, Trump’s response, how today compares with the 2009 Green Revolution and Obama’s response, and what it could mean for the Iran deal. Then they vent about how terrible the discussion about Iran is in DC / on Twitter. Tommy talks with Republican foreign policy expert Kori Schake about the eery similarity between the Trump administration’s comments about North Korea and the Bush administration’s rhetoric in the run-up to the Iraq war. Tommy interviewed undercover FBI agent Tamer Elnoury about his work penetrating and disrupting an al Qaeda cell plotting attacks in Canada and the United States. They discussed what it was like to live with and pretend to become a terrorist, including having to visit the Ground Zero memorial with a man who took pride in the 9/11 attacks and wanted to repeat them. His book, AMERICAN RADICAL, is great - read it! Tommy talks with Politico’s foreign affairs correspondent Nahal Toosi about Trump’s controversial decision to recognize Jerusalem as Israel’s capital. Then they discussed news reports indicating Rex Tillerson’s disastrous tenure as Secretary of State may be coming to a close. It was lit. Tommy talks with Senator Jeff Merkley about his fact-finding mission to Burma and Bangladesh to learn more about the ongoing ethnic cleansing and refugee crisis. They also discussed the Trump administration’s almost non-existent response, how social media has exacerbated the problem, and what Congress is trying to do to help. Tommy talks with Africa expert Ambassador Johnnie Carson about the coup in Zimbabwe that toppled Robert Mugabe, and the recent political turmoil in Kenya. Tommy talks with Middle East and ISIS expert Rob Malley about the resignation of Lebanon’s Prime Minister and how it plays into a broader middle east proxy war between Saudi Arabia and Iran. Then they talk about the fight against ISIS and the major NYT magazine story about civilians casualties in Iraq. Tommy and Asia expert and career diplomat Danny Russel discuss President Trump’s five nation, 13 day trip to Asia. They cover North Korea, Trump’s decision to meet with a mass murderer in the Philippines, and China’s political system. Tommy talks with former Senator Majority Leader and US Special Envoy for Middle East Peace George Mitchell and Alon Sachar about their book A Path to Peace, which details the history of the Middle East peace process and their efforts to forge an agreement during the Obama administration. Tommy sits down with Michael Morell, the former acting Director of the Central Intelligence Agency. They discuss his experience as President Bush’s briefer on 9/11, hunting Osama bin Laden, the state of ISIS, North Korea and the impending release of the JFK assassination files. It was sick. Tommy talks with Republican Congressman and Air Force veteran Adam Kinzinger. They discuss Trump’s decision to decertify the Iran deal, North Korea, Senator Corker’s criticism of Trump, the war in Afghanistan and how to understand our fight against terrorism. Tommy and Eliot Cohen, a counselor to Condoleezza Rice during the Bush administration, talks about his Atlantic piece “How Trump is Ending the American Era” and try to figure out what constitutes a Republican and Democratic foreign policy worldview in 2017. First, Tommy talks with Ben Rhodes about the mysterious attacks on our diplomats in Havana and the Trump administration’s decision to expel Cuban officials in response. Then, he’s joined by former Navy Secretary Ray Mabus to discuss his eight years leading the Navy as well as his time as the US Ambassador to Saudi Arabia. Tommy talks with Europe expert Dr. Karen Donfried about the German elections and the rise of the far-right AfD party. They also discuss why Russian hacking efforts didn’t work in Germany, what European capitals will do if Trump pulls out of the Iran deal, and how they view his war of words with North Korea. Tommy talks with New York Times columnist Nick Kristof and Nexus Fund Executive Director Sally Smith about the ongoing ethnic cleansing happening right now in Burma. Tommy talks with Will Hurd, a Republican representing Texas’s 23rd Congressional District, who served in the CIA for nearly a decade. They discussed Hurd’s role at the CIA, what motivated him to run for office, the Iran deal and ISIS. Tommy talks with former Lieutenant General and Ambassador to NATO Doug Lute about his six years managing the wars in Iraq and Afghanistan for Presidents Bush and Obama. Tommy gets an update on North Korea’s latest provocations from Asia expert Evan Medeiros. Then he talks with Eric Fanning, the former Secretary of the Army and the first openly gay head service secretary in history, about Trump’s transgender ban and his career at the Pentagon. Tommy speaks former AP correspondent Hannah Dreier about the ongoing humanitarian and political crisis in Venezuela. Dreier was the last American journalist to get a permanent work visa when she arrived in Venezuela in 2014 and reported from the capitol until June. Tommy talks with defense policy expert Kelly Magsamen about President Trump's speech announcing his Afghan war policy. They evaluate the substance of his plan and discuss whether any approach can actually improve the situation on the ground and allow us to get out. Tommy talks with former Secretary of Homeland Security Janet Napolitano about her efforts to combat right-wing extremists. Then he is joined by former Deputy CIA Director David Cohen to talk about what it was like to learn the world’s most closely guarded secrets, how the CIA works, and hear his David’s views on North Korea and Iran’s nuclear programs. Former Deputy National Security Advisor Ben Rhodes talks through Trump’s promise of “fire and fury” if North Korea threatens the US and today’s reports on advances in North Korea's nuclear program. Then Tommy is joined by Bill Browder, a businessman who became Putin’s #1 enemy after exposing corruption in Russia. Browder was the driving force behind the Magnitsky Act sanctions to punish Russian human rights abusers. Are they gonna’ nuke us? Tommy talks with former Deputy Secretary of State Tony Blinken about the Iran deal, whether it’s working, and if we can apply the lessons learned to the dangerous situation in North Korea. Then they talk about Secretary Tillerson’s record at State and tensions in Israel and Venezuela. Both of them really miss Joe Biden. Tommy talks with David Miliband, President and CEO of the International Rescue Committee (IRC) and former UK Secretary of State for Foreign Affairs, about the famine in four countries that has put 20 million people at risk of starvation. He also offers concrete ways that all of us can help. You can learn more or donate at: https://www.rescue.org/. Why did Putin do it? Tommy talks with journalist and Russia expert Julia Ioffe about not if but why Putin interfered in our election. What was Putin’s motivation and goal? Are we giving him too much credit or are we not responding forcefully enough? Tommy talks with former top defense official Derek Chollet about Donald Trump Jr.’s keystone cops collusion with Russia before transitioning to a conversation about the fight against ISIS in Mosul, Syria and the Trump administration’s policy in Afghanistan. It was incredible. Tell your friends. Tommy talks with former Obama National Security Advisor Susan Rice about her transition to civilian life, Syria, ISIS, Russia and Trump's approach to Africa. Tommy talks with former Deputy Secretary of Energy, defense policy and Europe expert Dr. Elizabeth Sherwood-Randall about the future of Europe in the wake of Brexit. Then they discussed nuclear weapons in the US and Pakistan, cybersecurity, the advanced science being done at our National Labs, and how government can recruit more women into national security jobs. Tommy talks with Senator Tim Kaine about how it’s possible that sixteen years after the 9/11 attacks, the congressional authorization that allowed us to respond with military force is the legal basis for wars against groups like ISIS that didn’t even exist at the time. Tommy talks with former US Ambassador to NATO Ivo Daalder about Trump’s disastrous trip to NATO before transitioning to a broader conversation about when the global community should use military force. Ivo offers an unvarnished take on the mistakes the US and NATO made in Libya, Iraq and Afghanistan. Tommy talks with former Deputy Secretary of State Bill Burns about his three decades at the State Department. They discuss US relations with Russia and Jared Kushner’s backchannel, Trump’s trip to Europe, Bill’s role in leading the Iran talks and what it means to be loyal to a President and country. Tommy and Pulitzer Prize winning journalist and New York Times East Africa bureau chief Jeffrey Gettleman discuss his new book Love, Africa. They talk about the risks that come with working in places like Somalia and South Sudan, including Jeffrey (repeatedly) being held at gunpoint, and the balance between reporting facts and telling stories to that help create empathy for people suffering. Tommy talks with former DOJ Official Matthew Miller about Trump's decision to fire FBI Director Jim Comey. Tommy and Bloomberg columnist Eli Lake review Trump’s first 100 days on foreign policy. They cover Trump’s staffing decisions, US relations with Russia, willingness to stand up for US values, management of North Korea, ISIS, Syria and the Middle East peace process. Tommy talks with Europe expert Dr. Karen Donfried about the French Presidential elections and the rise of far-right nationalist candidates like Marine Le Pen. They also discuss the potential for Russian interference in France, comparisons to Trump and why the French presidency could have major implications for the US. Tommy talks with former White House Chief of Staff Denis McDonough about the Bin Laden operation, Iraq, Syria and Russian hacking of our election. Senator Mark Warner talks with Tommy about why the Intelligence Committee's investigation into Russian interference in our election is the most important thing he’s done in public life. He also takes us behind the scenes of the Committee’s TOP SECRET work. Tommy and Middle East expert Colin Kahl discuss the Syrian civil war from when the protests first erupted in 2011 to President Trump’s cruise missile strike last week. They cover the roots of the conflict, Syria’s chemical weapons, Obama’s red line and Trump’s policy options going forward. Tommy and China expert Evan Medeiros preview Trump’s meeting with Chinese President Xi Jinping. They discuss the meticulous planning and choreography that goes into these talks, tensions in the South China Sea, Taiwan, human rights, and how the Chinese view Russian hacking of our election. Former US Ambassador to South Korea Mark Lippert talks about the threat from North Korea’s nuclear program, Trump’s “new” approach to the DPRK, the assassination of Kim Jong Nam and the attack on his life while serving as Ambassador. Intercept editor Glenn Greenwald joins to respond to criticism of Edward Snowden and to discuss his views on intelligence collection. Tommy and former US Ambassador to Russia Mike McFaul talk about the US-Russia relationship. We cover pop culture and Rocky IV, arms control, Russian harassment of US diplomats, Mike’s assessment of Putin’s leadership and when relations turned bad, if Romney was right to call Russia our number one geopolitical foe and the lessons America can learn from Putin’s rise. Tommy and Heather Higginbottom to discuss her journey from political campaigns to becoming the first woman to serve as Deputy Secretary of State for Management and Resources. We cover refugee vetting, pandemic response, women in foreign policy and Heather’s reflections on Secretary Kerry’s career. Tommy talks with Obama’s former Homeland Security and Chief Counterterrorism Advisor Lisa Monaco about terrorism, encryption, cyber security, the Boston bombings, Trump’s dysfunctional national security team and lots more scary stuff. Tommy and Obama’s former Deputy National Security Advisor for Strategic Communications Ben Rhodes discuss Ben’s career path, Obama’s Cairo speech, the damage Trump is doing, counterterrorism, restoring diplomatic relations with Cuba, Wikileaks, Snowden, Israel, Syria and more. Tommy is joined by Dan Restrepo, who served as a top Latin America advisor to President Obama. They discuss the historic opening between the US and Cuba, Mexico, immigration, Colombia’s civil war and Venezuela. Tommy is joined by former top Clinton aide and former Biden National Security Advisor Jake Sullivan. They discuss Jake’s experience leading the secret Iran deal negotiations, Russian hacking, Trump’s attacks on the intelligence community, Benghazi and more. 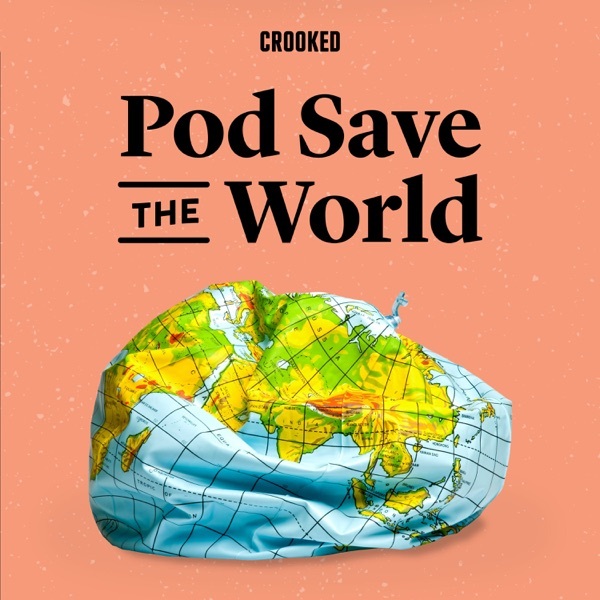 "Pod Save the World" launches Wednesday, February 1st!